Detroit Mayor Kwame Kilpatrick and his chief of staff, Christine Beatty, lied about their relationship last summer during a police whistle-blower trial that has cost the cash-strapped city more than $9 million, according to records obtained by the Free Press. The false testimony potentially exposes them to perjury charges. 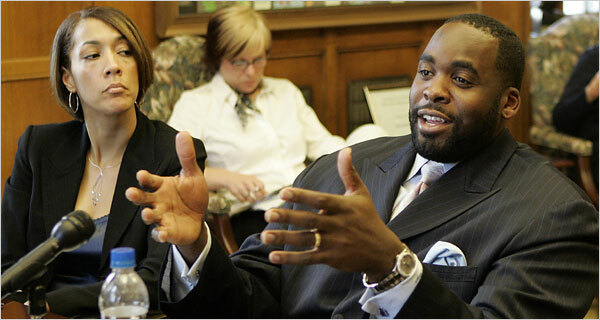 Kwame Kilpatrick and Christine Beatty denied in August testimony that they had a sexual relationship. But a series of text messages shows they engaged in romantic banter as well as planned and recounted sexual liaisons. The Kilpatrick-Christine Beatty relationship and Gary Brown’s dismissal are central to the whistle-blower suit filed by Brown and Harold Nelthrope. The two former police officers accuse Kwame Kilpatrick of retaliating against them because of their roles in an internal investigation of the mayor’s security team — a probe that potentially could have exposed his affair with Beatty. The newspaper examined nearly 14,000 text messages on Christine Beatty’s city-issued phone. The exchanges cover two months each in 2002-2003. The city has tried since 2004 to keep the text messages under wraps. It fought in court to keep them from being provided to the legal team for the former cops and went to court this month in an effort to kill a subpeona issued in a Free Press suit to learn more about the settlement. If Kilpatrick and Beatty are found to have committed perjury, they could face up to 15 years in prison under state law.